The Academy Awards will take place this Sunday and as with every year, as it comes down to crunch time it’s getting harder and harder to pick the winners. A few months ago, Birdman would have been the clear favorite to take home a huge amount of awards but now that seems very uncertain. Since the Golden Globes, The Grand Budapest Hotel and The Theory of Everything have made an incredible push for the nights top honors. Here are my picks and some commentary to set the stage for Sunday’s awards ceremony. Winners are noted in bold below. Harris’ thoughts: Best picture is always a tough call and in most years it comes down to two or three contenders. This year is no exception. This is a three horse race between The Grand Budapest Hotel (which won in the Best Musical/Comedy category at the Golden Globes), Boyhood (which won in the Best Drama category at the Golden Globes) and Birdman. In defending my own pick of The Imitation Game, I believe this was the best movie of the year. I will enjoy watching it again and again over the years. That on its own doesn’t make a movie the Best Picture. In the end, Birdman will take the nights top prize. It was an incredible film filled with impressive performances and a truly unique story and perspective. It wasn’t the movie I’ll be running to stream on Netflix but it was the best film of 2014. Harris’ thoughts: A few years ago, at the 85th Academy Awards, a strong trend was bucked. Beginning in 2007 at the 79th awards and every year until 2013, the winner for Best Director was the same as the winner for Best Picture. Movies like The Kings Speech, The Hurt Locker and No Country For Old Men all saw their directors earn top honors while they did the same. In 2013, Argo won Best Picture while Life of Pi director Ang Lee won Best Director. A few years later we have not had that dual win again. This year, I believe that the trend will return. Alejandro Innaritu did a phenomenal job with Birdman, staging the continuous shots that followed around a superb cast of actors and actresses. I predict that we will once again have a Best Director of this years Best Picture. This is probably the toughest category to pick a winner in this year. Each year there is one winner that is nearly impossible to predict. I believe thatBest Actor is this years toss up. You have three stories here. First, you have Michael Keaton. Three months ago he would have been the favorite to win. The movie was doing well and there was a ton of hype surrounding this incredible performance. Then the Golden Globes happened. Suddenly, Eddie Redmayne emerged as the person who could take down Birdman. Having seen both films, I believe that both actors could easily win here. 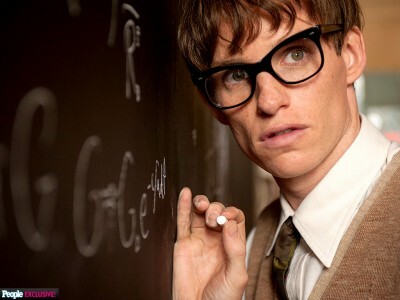 Redmayne was simply incredible in playing Dr. Stephen Hawking. The problem is, he was playing a real person which makes the role so much more attractive. On the other hand, Keaton’s character in Birdman is so tantalizingly fresh that it’s hard to look away. The other story here could be a major upset. While Keaton and Redmayne won at the Golden Globes, it will be interesting to see if a dark horse like Bradley Cooper or Steve Carell get any love from the Academy. I’ll stick with Redmayne who I believe gave the best performance of 2014. Patricia Arquette is likely the most favored nominee heading into the Oscars. Her performance in Boyhood was absolutely breathtaking and to be honest, she’s not up against much competition. Keira Knightley was good in Imitation Game, not great. Emma Stone’s role just wasn’t in focus in Birdman and we can’t just keep giving Meryl Streep awards for movies that aren’t masterpieces. That leaves Arquette. She deserves this award and earned it over the course of a decade in Boyhood. Picking the best screenplay, like the Best Director and Best Picture, can sometimes be in finding a pattern among an incredible amount of talent. In this case, you have three movies that can win. Two of those movies are based on very famous scientists and the other is centered around a music student. While it would be interesting to see a movie like Whiplash win, with its small profile and unknown cast, I believe it will be a battle between Hawking and Turing. 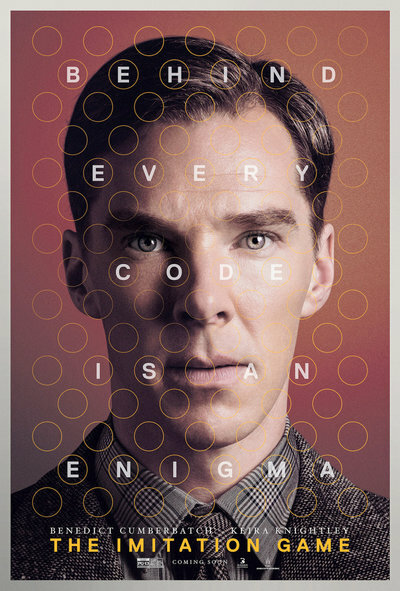 In this case, I think Turing will come out on top with the only win of the night for The Imitation Game. Best Original Screenplay is one of my favorite categories each year. It gives credit to the creative mind behind the best original piece of cinema of the year. In this case, you have the same three movies that will slug it out for Best Picture. As you’d imagine, the winner of Best Screenplay and Best Picture often go hand in hand and this year will be the same. 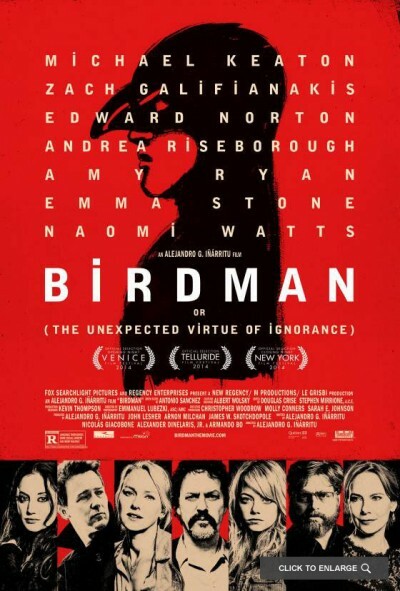 Birdman was the most creative work of the year and that’s what will be rewarded here. Please note that I did not pick the shorts because I don’t believe there is a way to accurately predict who will win in these categories.